The Israel Aircraft Industries Nesher (Hebrew: ?, "Vulture" - often mistranslated as "Eagle") is the Israeli version of the Dassault Mirage 5 multi-role fighter aircraft. Most were later sold to the Argentine Air Force as Daggers, and later upgraded as Fingers. Israel had to replace more than 60 aircraft lost during the Six Day War and the War of Attrition which followed. Before the war, Israel began co-development with Dassault to build the Mirage 5 and it was eventually built by Israel and named Raam in Hebrew (thunder). Dassault Aviation had developed the Mirage 5 at the request of the Israelis, who were the main foreign customers of the Mirage III. The Israeli Air Force (IAF) wanted the next version to have less all-weather capability in exchange for improved ordnance carrying capacity and range as the weather in the Middle East is mostly clear. In January 1969, the French government arms embargo on Israel (in response to the 1968 Israeli raid on Lebanon) prevented the first 30 Mirage 5 aircraft (which were already paid for by Israel) plus optional 20 from being delivered and cut off support for the existing Mirage IIICJ fleet. 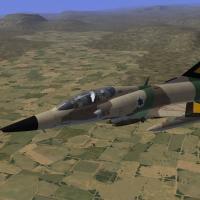 This was a setback for the Israeli Air Force, who needed the new Mirage to compensate for the losses of the Six Day War and was still using the Mirage IIIC. Israel then decided to produce the (Raam A and B project) airframes as it had the necessary plans, although Israel did not officially obtain a manufacturing license. Officially, Israel built the aircraft after obtaining a complete set of drawings. However, some sources claim Israel received 50 Mirage 5s in crates from French Air Force (AdA), while the AdA took over the 50 aircraft originally intended for Israel. Production began in 1969 with the first empty airframes with no weapons, electronics, seat, or engine included delivered directly from Dassault Aviation. The first Raam A was delivered in May, 1971. In November, 1971 the plane was renamed Nesher. The Neshers' airframe was identical to the Mirage 5, but there was an extensive refitting of Israeli avionics, a Martin-Baker zero-zero ejection seat, and improved provisions for a wider range of AAMs (Air-to-Air Missiles), including the Israeli Shafrir heat-seeking missile. Fifty-one Nesher fighters (Nesher S) and ten Nesher two-seat trainers (Nesher T) were built in all. The Nesher had simpler avionics than the Mirage IIIC but was slightly less maneuverable. However, it had longer range and bigger payload. The reduced maneuverability did not prevent the Nesher from performing well in air combat during the Yom Kippur war. Nesher production was phased out from 1978 to make way for an improved Mirage derivative that had been planned in parallel, in which the Atar engine was replaced by an Israeli-built General Electric J79 engine, the engine used on the American Lockheed F-104 Starfighter and McDonnell Douglas F-4 Phantom II fighters. The result was the IAI Kfir. The first Nesher prototype flew in September 1969, with production deliveries to the IAF beginning in May 1971, ending in February 1974. These aircraft performed well during the 1973 Yom Kippur War, claiming over a hundred kills. 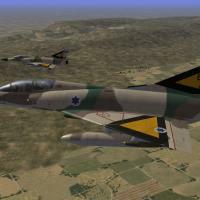 Install: Strike Fighters Israel or Strike Fighters merge.